Romance is alive! The story of the VERY first Gretna Green lovelock! Luckily we were able to reassure her.... She sent us this lovely story! Fabulous to hear from the VERY first couple to place a lovelock on our bridge, it's such a great story! 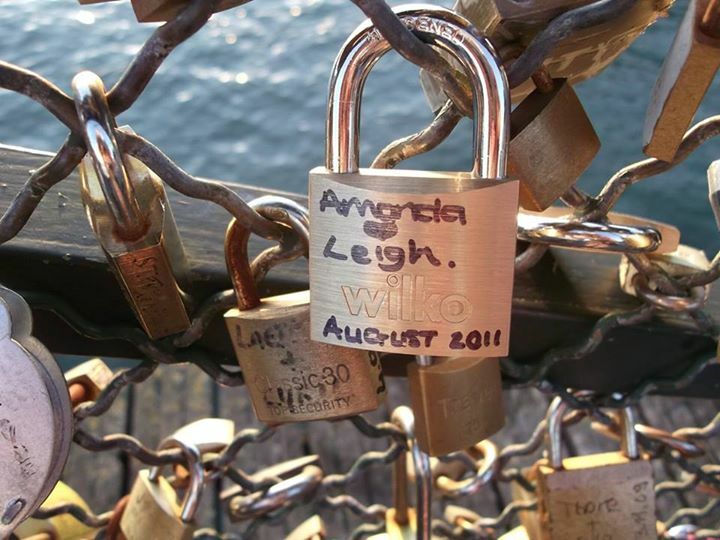 Anyway in September of 2012 we went on holiday to Scotland and again I went armed with a lovelock in case we found somewhere special in which to place it. Whilst out on our travels we stopped at Gretna Green and whatsapped our location to family to spook them into thinking we had eloped and got married, which of course we hadn't. We did have some news for our family though as we had recently found out that I was pregnant with our daughter Poppy. Whilst at Gretna Green we came across the courtship maze and thought what more romantic place to place our love lock than here on the courtship maze bridge. There were no other locks around so we were the first to place one there. Upon leaving the maze as there was no river into which we could throw our keys we decided to bury a key each at each entrance to the maze. P.S YOU can get your very own Gretna Green Lovelock here!